Most families have hundreds of photos that they would like to preserve for a lifetime of enjoyment. Unfortunately, many of them sit in albums, books, or lay loose in boxes, getting scratches and accumulating dirt. Fortunately, there’s Photo Stamp Remover. Just scan photos into the computer and use the watermark remover to clean up scratches, cracks, and dust spots. With Photo Stamp Remover, you can restore photos with the minimum of fuss. 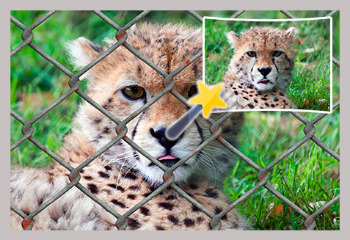 Just open a photo in the program, select the area that needs to be restored and click Preview. If you like what you see, click Start. That’s basically all you need to do. Using its advanced restoration algorithm, the program removes the imperfection automatically. Defects blend into the background cleanly. With its batch mode support, watermark remover enables you to process more than one photo at a time. For example, you can remove a date stamp, which your camera left on several photos. Simply define the area where the stamp is located and begin the healing process. Photo Stamp Remover will remove the date stamp on all photos automatically while you’re sipping your coffee.